We are in sunny Austin, Texas and have a full day ahead of us. In about 15 minutes, we are going to kick off a couple of TechCrunch events here, starting with a roundtable that I will be hosting on the Grassroots Web, followed by our Austin MeetUp. We’ll be streaming the roundtable live right here. The Web, by its very nature, is not only a global medium, but a grassroots one. People find each other on the Web according to their niche interests, and sometimes, somehow those interests spread. How does that happen? Anyone trying to reach a large audience in an authentic way—politicians, marketers, social organizers—is trying to tap into the Web grassroots because those roots are digitally connected and networked together, making it easier for ideas to spread like wildfire. How will the Grassroots Web affect the current election? At what point does Grasroots + Personal Media = Social Change? Does the rise of the Grassroots Web spell the demise of traditional Madison Avenue advertising? Join us here to find out. And for those in Austin, we’ll keep the party going at our MeetUp afterwards. 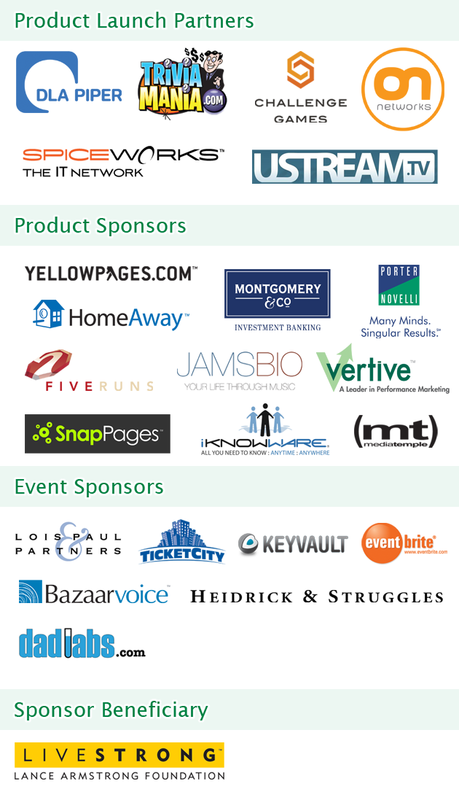 And of course, none of this would be possible without our awesome sponsors. Thank you. Challenge Games was founded in 2006 with the mission of creating online, short-form games that are challenging, fun and easy to play whether you’re a serious or casual gamer. The big idea is to create cool games that can be played in 3-10 minute time increments anytime, from anywhere. Enjoy Duels Warstorm(use the referral code “TechCrunch”),Duels, and Baseball Boss. DLA Piper has worked hand in hand with the high-tech industry for more than 30 years, bringing together venture capitalists and emerging companies. Our Venture Capital team offers sophisticated integrated legal services to venture funds and their portfolio companies, domestically and internationally. Our Venture Pipeline is a DLA Piper business unit that matches dynamic young companies with great investors. No other law firm has anything like it. With more than 3,700 lawyers in 65 offices around the world, including leading high-tech centers like Austin, we are among the global leaders in technology law. From the quality of our legal advice and business insight to the efficiency of our legal teams, we believe that when it comes to the way we serve and interact with our clients, everything matters. ON Networks is a leading independent distributor and producer of original, episodic HD programming. The ON Networks AllScreen Syndication Network is one of the largest multi-screen TV show and video advertising distribution networks in the world. It’s the first to deliver sponsored programs of any format from any content creator to a guaranteed number of global viewers wherever they watch shows – including TVs, computers, mobile phones, gaming or other devices as well as hotel, business and retail networks. The AllScreen Syndication Network can distribute TV shows and accompanying advertisements to millions of viewers each month across the United States and Europe through distribution partners include Verizon, AT&T, iTunes, TiVo, Telecom Italia and more. In addition to helping reach viewers on many screens, the AllScreen Network provides services that allow customers to directly publish video content and track audience engagement metrics and data. offers while they’re doing their jobs in Spiceworks. TriviaMania.com is an innovative new game site that offers two great games for trivia lovers. In one easy-to-install, free download you’ll get All-In-Trivia, an exciting trivia game where you can outsmart your friends, AND First2Five, a game that lets you test your knowledge by being the first player to answer five questions correctly. Visit TriviaMania.com, download the free trivia software and register to get started. TriviaMania.com is a safe, fun and fair way to play trivia games with other players and earn real prizes! TriviaManiacs enjoy 24/7 games and earn money for outsmarting their opponents! So put your money where your brain is at TriviaMania.com! Ustream.Tv is the leading internet broadcasting platform. Ustream’s proprietary technology powers an easy-to-use, web-based interface, allowing anyone with a camera, computer and Internet connection to broadcast live to the world. Integrated with a host of interactive tools including chatrooms, co-host, and shout meter, Ustream’s platform delivers real-time, social experiences on the web. Since its beta launch in March 2007, Ustream has grown to 360,000 registered users broadcasting 15,000 live shows a day. Ustream.TV is headquartered in Mountain View, California, and is privately held. For more information, please visit: www.ustream.tv. FiveRuns provides simple and affordable products for monitoring Rails applications and their supporting infrastructure. Our products are written in Ruby and Ruby on Rails and delivered to market by an experienced management team and expert Ruby developers. Our goal is to further the adoption of Ruby on Rails by offering a suite of products that delight and add compelling value to both Rails developers and systems administrators alike. HomeAway connect homeowners and property managers with travelers who seek the space, value and amenities of vacation rental homes as an alternative to hotels. With more than 309,000 global listings across the sites, travelers may easily search for budget to luxury-priced vacation rentals on HomeAway.com, VRBO.com, VacationRentals.com, Holiday-Rentals.co.uk, OwnersDirect.co.uk, FeWo-direkt.de and Abritel.fr. The sites also feature Reviews and the HomeAway Rental Guarantee, which help ensure a memorable experience. HomeAway is headquartered in Austin, Texas and funded by Austin Ventures, Redpoint Ventures, American Capital, Institutional Venture Partners and Trident Capital. iKnowWares web-based application empowers companies to manage processes via secure mobile SaaS delivery of real time information for visibility anytime, anywhere into operations, logistics, and business process. JamsBio is a social community to share your life through music. JamsBio offers a rich platform on top of a database of over 4 million songs for users to share music memories; review albums, songs and concerts; dedicate music to that special someone; create and debate Top-5 music lists; play games to test your knowledge of music; and keep a pulse on the world of music through original columns, podcasts, and news articles. JamsBio is wholly owned and operated by Mouth Watering Media LLC, a media company based in Houston, Texas. Porter Novelli is one of the world’s leading public relations agencies and is represented in all major markets. With a focus on effective stakeholder communications and adopting a holistic, media-neutral approach, Porter Novelli develops public relations programs that deliver value and impact to its clients’ business. Porter Novelli was founded in Washington, D.C., in 1972 and is a part of Omnicom Group. Omnicom’s branded networks and numerous specialty firms provide advertising, strategic media planning and buying, digital and interactive, direct and promotional marketing, public relations and other specialty communications services to over 5,000 clients in more than 100 countries. For more information, please visit www.porternovelli.com. SnapPages is an online website creation tool that provides a simple solution for creating great looking web sites. SnapPages makes it easy for anyone to build and maintain high-quality websites without the need for a programmer or a designer, and you can do it all online. Vertive is a leading performance marketing company. The company publishes more than 25 Websites with useful and unique editorial content to promote a variety of products and services. Vertive’s sites let consumers research, review, compare and get the products and services they want. The company’s websites promote products and services of partners and it is paid when a transaction (lead, referral, or sale) occurs. Vertive works directly with merchants and through the leading affiliate networks like Commission Junction and LinkShare. Austin-based Vertive has been profitable since its inception in 2003. Career opportunities at Vertive abound for savvy developers and marketers. “Need something?” Online or mobile, YELLOWPAGES.COM is your source for comprehensive local business information. YELLOWPAGES.COM connects consumers to local businesses across the three screens they use most – Web, mobile and TV through AT&T U-verse services. As one of today’s leading local search sites, YELLOWPAGES.COM connects consumers to rich local information – maps, driving directions, user reviews, videos and more. And now you can keep your life in motion with YELLOWPAGES.COM Mobile. Find what you need locally wherever, however and whenever you need something on the go. For more information on how you can get YELLOWPAGES.COM on your mobile device visit www.yellowpages.com/products. BazaarVoice enables the world’s largest brands to capture and amplify the voices of their customers to build sales. We bring word of mouth to ecommerce. Bazaarvoice products and services enable consumers to share ratings, reviews, questions, answers, and stories about products and brands on client websites. Bazaarvoice helps clients maximize the strategic impact of user-generated review content through community management, advanced analytics, search engine optimization, and syndication across the Web and to offline channels. DadLabs is an edgy, fun and Informative show for dads and the women who tolerate and/or love them. Humorous tips and advice from dads on parenting, fatherhood, children, and coping with wives and mothers. Eventbrite is the world’s largest online event management and self-service ticketing site. Distinguished by its ease-of-use and cost-effectiveness, EventBrite has helped tens of thousands of companies, organizations and non-profits take advantage of the Internet to promote and sell-out their events. Heidrick & Struggles is recognized as one of the world’s leading executive search firms. For over fifty years we have been building deep relationships with the world’s most talented individuals on behalf of the world’s most successful companies. Through the strategic acquisition, development and retention of talent we help our clients – from the most established market giants to the newest market disruptors- build winning leadership teams. Keyvault is a method for securely sharing your sensitive information such as website logins, bank details or credit card numbers. Currently, users often send this information via plain text e-mails or instant messages because conventional methods for securing it are too complicated for the average user. This leaves the information vulnerable to interception, resulting in server compromises, identity thefts, credit card fraud, etc. Keyvault provides an easy to use solution, limiting your exposure when you need to electronically share private information with others. Lois Paul & Partners is a leading, national strategic communications agency that provides a wide range of public relations services to emerging and established high technology, life sciences and clean energy companies. The agency is headquartered in Woburn, Massachusetts, with an office in Austin, Texas. MediaTemple is an industry leading, privately held, profitable web hosting and software application service provider in California. Since 1998, (mt) has provided businesses worldwide with professional-class network environments for web, email, applications, and rich media content. TicketCity owns one of the largest ticket inventories in the world. In business for 18 years and as the first online ticket broker, TicketCity sells tickets to all events but specializes in college sports and championship events. Having attended many events, the TicketCity team provides expert recommendations and unparalleled service. Founded in 1997 by cancer survivor and champion cyclist Lance Armstrong, the LAF is a registered 501(c)(3) nonprofit organization located in Austin, Texas.